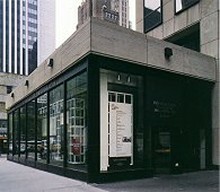 The international Center of Photography is the nation's foremost museum exclusively devoted to the showing of this century's greatest photography. Major works of most of the world's premiere photographic journalists and artists form the very earliest to the most recent have been shown here. The problem the Center management faced was that a particular vintage photographic exhibition soon to be featured at the Center was intenesely sensitive to the degradation of visible and ultraviolet light. The Center had an overwhelming need to protect the exhibition and take precautions beyond the normal procedures. Llumar Solar Control Window Film is a laminate of strong polyester and a Llumalloy metal alloy coating infused with ultraviolet inhibitors, bonded by a proprietary clear, distortion- free adhesive and finished with a patented scratch-resistant (SR) finish. High tech solar control films are manufactured using a state-of-the-art sputtering process which applies matal alloys to the base film. The durable, scratch-resistant, crystal clear SR coating provides carefree mantenance with most coventional methods of window cleaning. Llumar UV CL SR PS, a clear, ultraviolet light-resistant film, was used in the reception area to allow passers by to see in. Together, the films have virtually eliminated ultraviolet light (99%) within the exhibit area. The films were professionally installed and use a long lasting, distortion-free adhesive system to provide the cleanest, hardest, thinnest bond with the window panes. The installation of Llumar films enabled the Center to create the safest possible environment to display photographs.